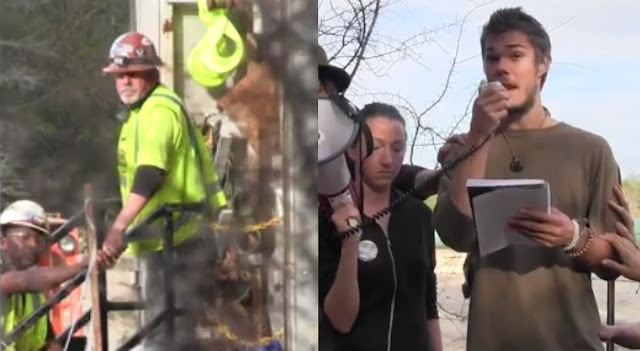 Water Protectors in Florida wrote a letter to the Sabal Trail Pipeline workers and delivered their message in person with love in their hearts. "The Sabal Trail Pipeline and all other major fossil fuel pipelines must be stopped. But that does not mean that we lose our compassion for our fellow human beings." said Water protectors. We know you are hard at work today to support your families. It is not our intention to take your jobs away, or disrupt your lives. We know what it means to work hard. Many of left our jobs and our families to prioritize in protecting our planet, our water, our land, our communities - for our kids, our grandchildren and all future generations. We are here to protect all life - but we have to recognize that our dependence on fossil fuels is destroying this planet. Is it worth the risk? Every year, on average, 284 significant pipeline incidents occur. They have broken and leaked over and over again. These incidents affect all our communities by poisoning our drinking water, potential explosions and decreasing the values of our homes. We recognize that we use fossil fuels, too, and we are doing the best we can to transition. We see a future where we can all have jobs that support all of our well being. For every job that HARMS the earth, we plan on creating 10 jobs to HELP the earth. We know this is challenging for you, and for us. We're asking you to take a moment and think about what we have shared with you today. Responses to "Water Protectors in Florida delivered a powerful love message to pipeline workers"